Wakefield Trinity Wildcats' Max Jowitt.' Picture: Jonathan Gawthorpe. 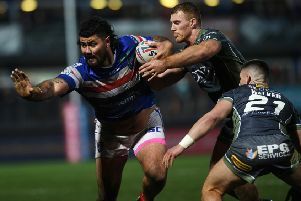 Twelve-man Wigan Warriors overcame the loss of skipper Sean O’Loughlin to secure a last-second 22-18 win over Wakefield Trinity Warriors to extend their winning run to seven matches. The first half was a fiery encounter with Wigan coming from behind to lead at the break and having to cope with two players being sin-binned and one sent off. Max Jowitt put the visitors in front early on before Wigan finally hit back through tries from Oliver Gildart and Sam Powell, both set up by the brilliant George Williams, to lead 10-6 at the interval. The half was marred with both teams guilty of cheap shots and Wigan paid the penalty three times in total with both Dom Manfredi and Josh Charnley spending time in the sin bin, while captain O’Loughlin was sent-off for the first time in his career. The Warriors played the best part of an hour with 12 men and they refused to lie down, but it looked like they would come away with nothing as they headed into the final seconds two points behind – but more magic from Williams saw him put in a pinpoint kick for Lewis Tierney to touch down for his second try and win the game for Wigan. The visitors got off to a dream start as they took lead after just five minutes when full-back Jowitt stormed on to a short inside ball from Liam Finn to crash over, Finn then converted as the Wildcats led 6-0. Things went from bad to worse for the Warriors after 18 minutes when winger Manfredi was sent to the sin bin for striking out. Wakefield attempted to take full advantage of the extra man and they almost made Wigan pay, but a superb tackle from Charnley prevented Craig Hall from scoring in the corner. Wigan got on the score sheet after 25 minutes thanks to a moment of brilliance from Williams, the young stand-off gave a neat show and go before offloading inside for Gildart to go over. Matty Smith was off target with the conversion attempt as Wakefield led 6-4. The Warriors were holding their own with 12 men, with Tierney again going close, but seconds after Manfredi returned they lost another man as Charnley was dismissed for 10 minutes after holding back Hall as he chased a loose ball. The Warriors crossed for the second try of the night with Charnley in the bin as Sam Powell was on hand to collect another inside ball from Williams to put them in front. Smith made no mistake this time as they led 10-6 at the break. Referee James Child ensured Wigan played the remainder of the game with 12 men as he sent Wigan skipper O’Loughlin off in the 39th for a high tackle on Chris Annakin. Wakefield finally made that extra man count two minutes after half-time when Reece Lyne went over in the corner and Finn converted. Wakefield were throwing everything at Wigan, who could not keep the visitors out for long as a long looping ball found Ben Jones-Bishop and he touched down in the corner. Finn missed the conversion but they led 16-10. They extended their lead to eight points with Finn slotting over a penalty as the Warriors tired, but the home side refused to give up and were soon back in the contest. They upped their intensity and received a penalty for a high tackle on Manfredi, they then spread the ball to the left with Tierney on hand to cross over, Smith converted from the touchline as they trailed by just two. With the clock ticking down, Williams put boot to ball and Tierney was hand to win the game in the corner, with Smith converting for a 22-18 success. Wigan: S. Tomkins, Tierney, Charnley, Gildart, Manfredi, Williams, Smith, Bretherton, Powell, Flower, Isa, Sutton, O’Loughlin. Subs: Tautai, Shorrocks, Shelford, Davies. Wakefield: Jowitt, Hall, Lyne, B. Tupou, Jones-Bishop, Miller, Finn, Fifita, Moore, Arona, Molloy, Ashurst, Sio. Subs: Annakin, Walker, Walton, Arundel.